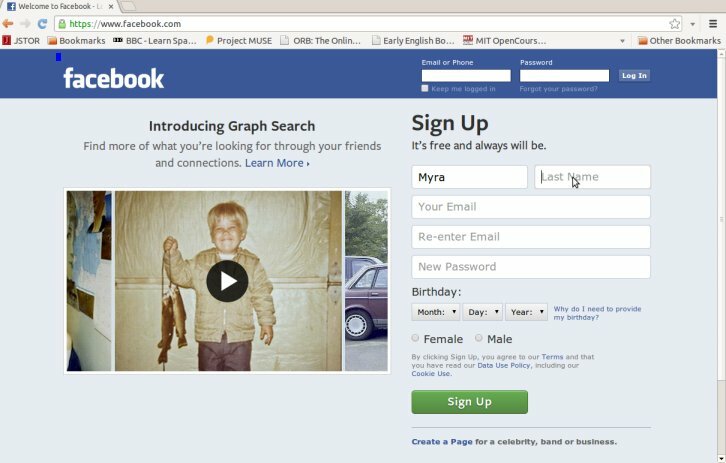 What can I use Facebook for? Facebook is a social media website and it is used by a lot of people. Chances are you want to have an account so you can easily share pictures, videos, and play games with your friends and family! Before we begin, there are a few words to be familiar with! Profile – This is where you’ll see your stuff: picture albums, videos, and fun links your friends have shared with you! Post – A Facebook “Post” is a message you can either write on your own wall, or someone else’s wall! Facebook Friend – A Facebook Friend is someone who you can share pictures, post on each others “wall,” and chat! A Facebook “Like” means just that! When you click the thumbs up on a picture, or post, or video: it means that you like it! Remember that others can see what you like, just as you can see what others like! The News Feed is the place on Facebook where you will see all the updates, pictures, and activities that your friends have been doing lately. It is the very center of your main account page (the dashboard). You might hear the words Social Media a lot when people talk about Facebook, or Pinterest and Tumblr. This just means that a lot of people use it to get together and talk with one another. Your Facebook “Wall” is where you and your friends can post pictures, videos, and other links for everyone to see. Do not use the Wall if you don’t want anyone else to see the thing you’re posting! We’ll talk about privacy later in the Tutorial! Let’s get started! Activity #1: Sign-up an account. Register an account: note you don’t have to use your real name! Step one: register your own Facebook account. You must enter your real name, email, and a password. Facebook also requires a birth date. I want you to skip to the final steps, we can add friends and other information later! Skip directly to adding a picture. Skip through these steps– we’ll get to them later! Last step: upload a picture. This can be done by choosing “Upload a Photo” and selecting one from your computer. Remember to have a photograph ready! And it can be a picture of anything (a flower, your dog, cookies) you like, within Facebook’s rules. This means: try to use a photograph you took yourself! Now you’re signed up! Congratulations! You can add any photo you like! It doesn’t have to be yourself. 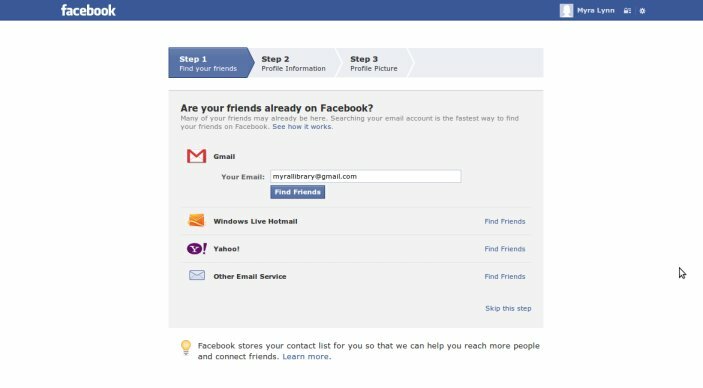 Remember that your Facebook account is called a “profile.” And now that you have one, here’s what you can do with it! Messages – This is on the left hand side of your page. You want to be sure to use this messaging feature to talk with your Facebook Friends. Remember that if someone is not your friend, and they message you, their email will be sent to Other Messages – be sure to check this from time to time! 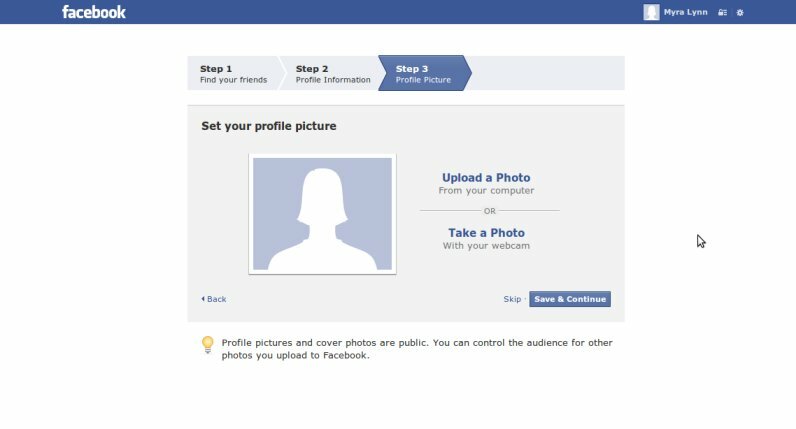 Pictures – Facebook makes uploading your pictures very easy! Just find the image(s) and drag and drop! Be sure to take the time to name your photo album. 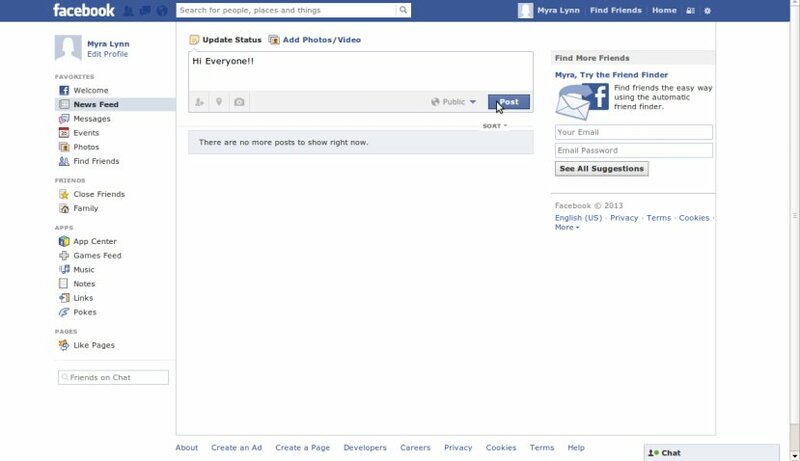 Newsfeed- The Newsfeed, or your status, is how Facebook gathers all your friends’ public activities directly to you! Remember when you post in your Newsfeed, everyone can see it! So be sure to use Facebook Messaging if you want to talk to someone privately. Facebook is a great way to keep up with your friends! 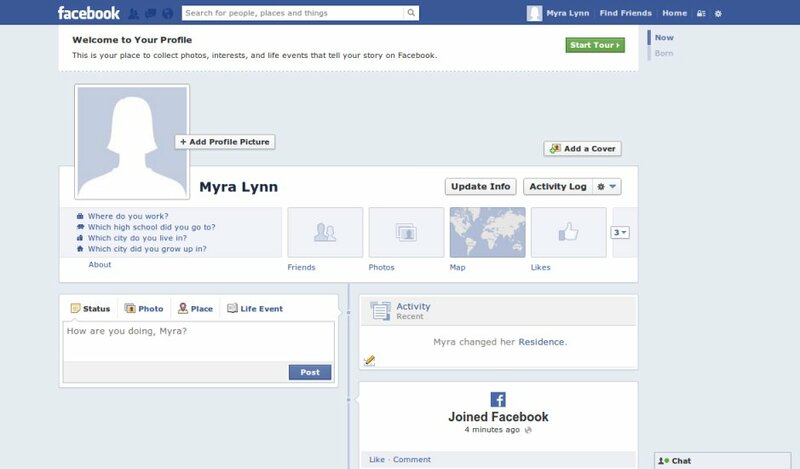 To find your friends and family and “add” them to your Facebook profile, you must search their name in Facebook search! After you search your friend’s name, click on your friend’s profile, and click “add friend.” Now wait until your friend accepts your request! Make sure to only add friends you actually know! 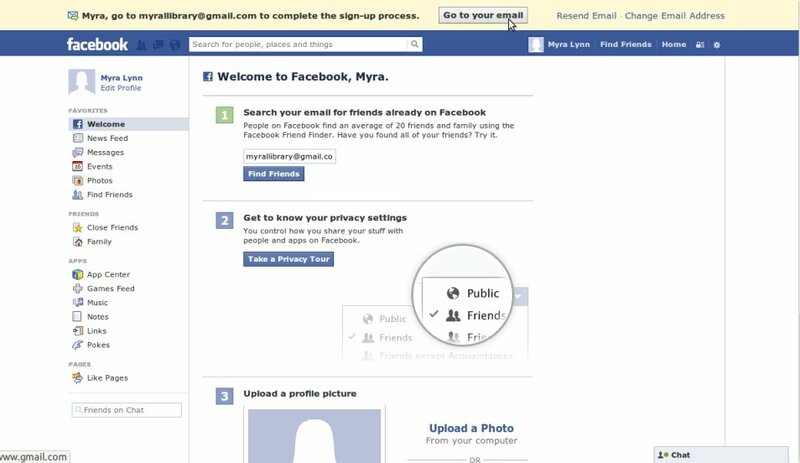 Privacy and Security are two very important concerns when it comes to using Facebook! Your privacy setting can be found in the right upperhand corner! It is a little lock. Make sure you regularly check your security settings – perhaps once a month. 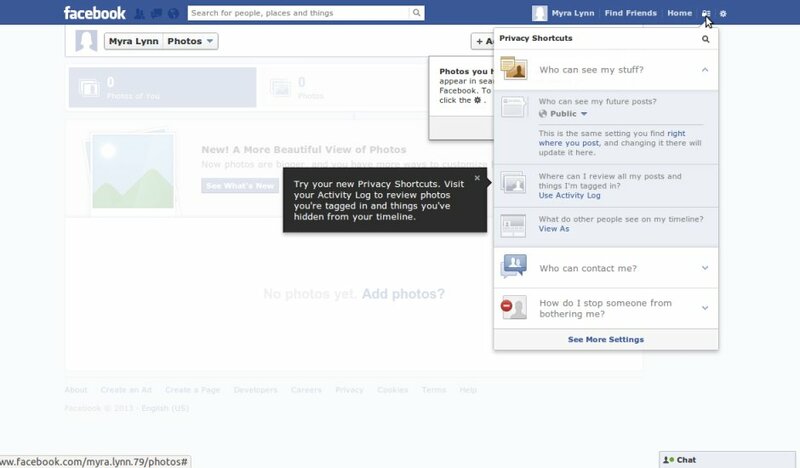 Make sure you have your settings set to Friends Only, so that your pictures and posts cannot be seen by the public. Make sure that you report anyone that might be bothering you! Finally, remember that Facebook is meant to be fun!